All American Christmas films make me think is that every American family is obnoxious. I knew as soon as I saw David Koechner that bad tidings were coming… To him imbuing subtlety is as hard as it is for him to spell. Like Home Alone before it this festive season brings only acrimony and ascerbic comments in the Engel house. Tom Scott) and Sarah (Toni Collette) try in vain to keep the peace, but the impolite hordes are too aggressively unlikeable to overcome. After one too many appalling comments, young Max swears off Christmas for good, much to the chagrin of German speaking Grandma who repeatedly tells one and all not to take Christmas for granted… especially as German folklore tells of an especially aggressive counterpart to happy Saint Nic. Of course they take Christmas for granted, inviting all too many vaguely Christmas themed bad guys and unlikely animated objects. You imagine it, and if it only pops up around December annually, it’s probably here, and it boasts malevolent intent. 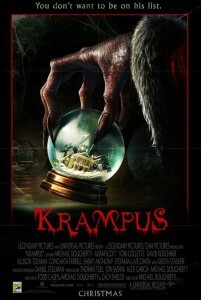 Unfortunately while Krampus sets a decent stage nothing goes down the way it should, the film wastes some truly creepy looking inventions with seventy minutes of PG dilution. They try to overcome this by throwing a grab bag of scary decorations at the tree and hoping some stick. Some bits do, too many don’t, and the cop out ending certainly doesn’t help festivities to end on a high. Final Rating – 6.5 / 10. Only slightly less scary than Home Alone.